LOS ANGELES, CA – Wednesday, February 18, 2015 — “When The Stillness Comes,” the first new track from Slayer in nearly a year, will be available as part of Record Store Day on April 18, it is announced today by Slayer and Nuclear Blast. 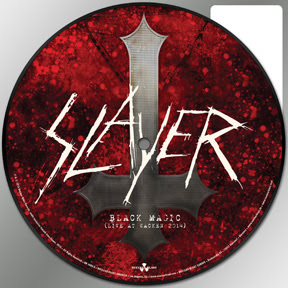 The song, accompanied by a live recording of “Black Magic,” from the band’s 1983 album Show No Mercy and recorded live at the 2014 Wacken Open Air Festival, will be available as a limited-edition (only 5000 copies worldwide), 7-inch vinyl picture disc exclusively at all participating independent record stories worldwide. Log onto www.recordstoreday.com for the list of stores.